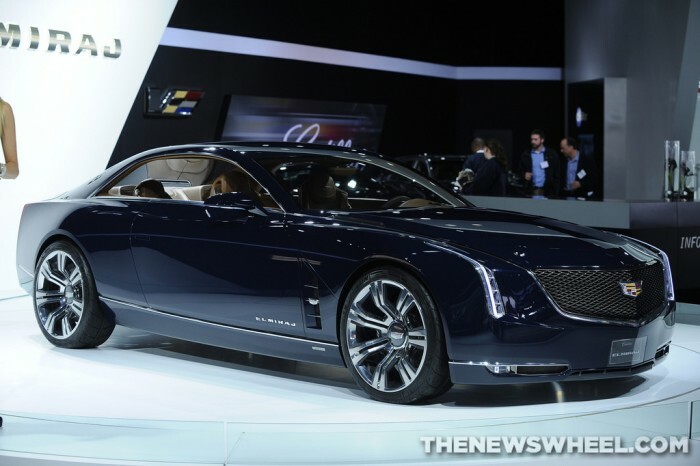 The Cadillac LTS will take cues from the Elmiraj concept. We’ve heard a fair amount about the 2016 LTS, Cadillac’s upcoming flagship sedan—even that it might not be called the Cadillac LTS. The latest news concerns the 2016 Cadillac LTS trim levels. Expect three trims in total, likely Premium, Luxury, and Platinum. There is a possible Vsport variant in the works, but we can’t confirm that yet. While we don’t know much about the interior, such as color options, materials, and the possibility of heated armrests and headrests, GM Authority is reporting that each of the three trim levels will be distinguished by its rear seat. The base level, Premium, will feature two buckets along with a compressed middle seat. True luxury begins on the Luxury level—go figure—which is said to feature a fixed center console for elements such as the AV input and heated and cooled seats. It is the Platinum trim, of course, that is most desirable, with reclining rear seats and a massaging function. The Cadillac LTS will be based on the Elmiraj concept that debuted in 2013 at the Pebble Beach Concours d’Elegance. The production model will appear at the same event, in 2015.